This “Pipérade Revisited” is a colorful dish, simply because it really represents what Citron et Vanille is all about…French, Italian, Mediterranean cuisine with a contemporary twist, using local ingredients. Pipérade is a traditional Basque recipe (piper meaning pepper in Occitan language) made with Basque peppers, Piment d’Espelette, onions and tomatoes. I twisted it a little to adapt the whole dish with local ingredients and make it a little less traditional with the quail egg. I also used poblano peppers that are a great alternative to Basque peppers and widely available in California. 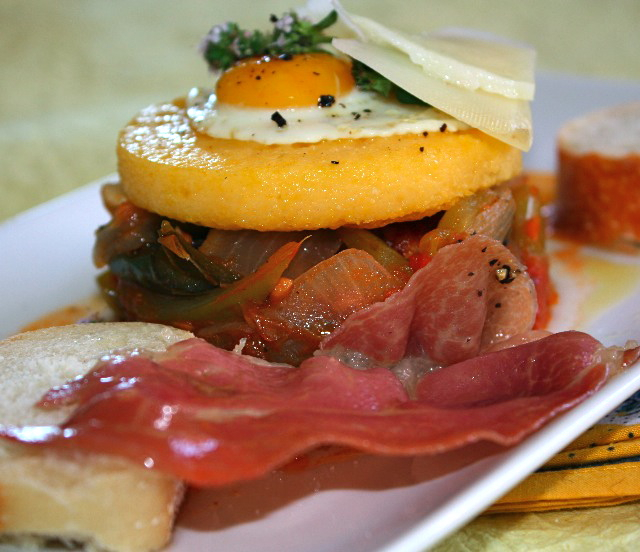 Usually the egg is added at the end of the cooking process inside the pipérade, I added mine on top of the polenta crostino. The Jambon de Bayonne (a basque cured ham) is also traditionally cooked and added inside the pipérade. I used Serrano ham, but prosciutto di parma works perfectly fine too. In this version, I grilled the ham and added on the side. For the crostino, polenta has been cooked in a broth infused with thyme and finished with Basque sheep cheese such as Etorki, but Petit Basque can be a fair alternative if you cannot find Etorki. I topped it all with the cutest of all the eggs, quail egg. I love to substitute quail eggs to regular eggs, they do add an elegant finish to a small bite. This is a very versatile dish, you can serve it as a canape, an appetizer, then you need about 2 per person or make bigger crostoni and serve it as a main course. On fait comme on veut! we do as we please! Now knowing how much I adore making small bites, that’s how I serve mine. For the polenta, you can use the express polenta, or the regular one which takes over one hour to prepare. It’s up to you, if you have time or not. The express polenta is an alternative when the focus of a dish is not on polenta like this one, and is an add-on. Heat olive oil in a pan and add onions. When onions are soft and golden brown, add peppers. Cook for out 10 minutes, then add tomates, garlic and herbs, salt and pepper. Adjust with sugar since the tomatoes tend to add a little acidity. Cover and cook slowly for about 30-45 minutes until the pipérade has reached a thick consistency and all the water has evaporated. Bring broth to a boil, add thyme. Let it boil for a few minutes, then add polenta. Keep stirring until the polenta has absorbed the broth (depending on which type polenta you used). When the polenta is cooked, adjust with salt and add cheese, stir until the cheese has melted and is well incorporated into the polenta. Pour polenta in a flat tray, the polenta needs to be 1.5 cm thick. Let it cool. When cooled cut with cookie ring of about 6 cm diameter. Grill polenta in a grill pan. Grill each ham slice. Heat olive oil in a pan, and cook quail eggs, sunny side up. Add salt and pepper. Using a Ring, form a small tower with tapenade, top it with polenta crostino, add a quail egg, shave some cheese on top, and serve it with a slice of cured ham. This entry was posted by silvia on August 1, 2010 at 5:17 pm, and is filed under Vegetables, Vegetarian - dairy. Follow any responses to this post through RSS 2.0.You can leave a response or trackback from your own site. Silvia, congratulations on your partnership with Basil! Fantastic! I love this recipe – quail eggs are instantly elegant, and I love the versatility of this dish – appetizer, main course, lunch or breakfast! This would be especially lovely for a brunch! congrats ,silvia!your interview is like your dish:gorgeous! Quel délicieux repas. Que j’aimerais. This looks wonderful! When I lived in Paris I often went to Chez Glandine, a Basque restaurant that served up fantastic food (at student prices!). Brilliant flavours! Oops – sorry for the typo – that’s Chez Gladines, rue des cinq diamants, in the 13th for anyone who’s in the vicinity! Congratulations on becoming a contributing editor !! This dish looks delicious and I love how you used quail eggs in it. Silvia – Congratulations on your upcoming works with Basil Magazine! You really should start your own cookbook as all your recipes are your creative and experienced culinary works. I have yet to have Basque cuisine, although my ancestry is of the Basque peoples. An exquisite looking dish. Yes…congratulations! How exciting is this! I have never used quail eggs before, but after reading this post, I want to go and buy some. Where do you get them? Congratulations on being in the magazine, so exciting. What an amazing recipe! So rich and satisfying. Oh, good for you! What an accomplishment! Your dish is fabulous–love the little egg on top! Hey Silvia, congratulations, you deserved it! This is such a wonderful news. Wishing you all the best and many more to come. congrats! the article is nicely done and you look so professional! i love it when you use quail eggs in your dishes – i still need to find a local source for quail and duck eggs around here. Much congratulations. You deserve. You are a truly culinary inspiration. Beautiful dish. They could not have chosen a better one. Best of luck going forward with you new endeavor! Superbe recette, comme c’est souvent le cas, Silvia! Vraiment tout ça semble extrêmement appétissant! Silvia…adapt away…I always appreciate your very personal creative twist on some of my favourite cuisines. Ooh la la…a new endeavour is bringing a very talented Foodie in a place she so deserves to be. Enjoy everything that comes along on that journey. Congrats!!! Très belle photo pour un plat qui m’ouvre l’appétit! Congratulations! I’m happy that your creativity will be enjoyed by many more through Basil Magazine. Beautiful picture, too. Congrats to you Sylvia! You are a talented chef~happy to see some fun projects headed your way. Congrats Silvia on your new writing gig!! Love this dish and the gorgeous photos! Very adroit execution of several culinary cultures! I finally have had time to check out your interview – how cool! Your look beautiful as always in the photo, I love it. And congrats! This is a great dish – and do you know, I have finally found quail eggs! beautiful recipe, so fancy and tasty looking!! !